View of the Overgrown Quarry June 2014. A disused quarry in a pegmatite known for its large feldspar crystals. First opened in the late 1870s, the Mining Journal records that production was hampered by severe winters on this exposed common. Early production was for pure feldspar which was used for making glass and the quarry was known locally as the glass mine. Although worked mainly as a quarry there are reputed to be underground workings. The quarry was re-opened in 1917, during the First World War, to provide feldspar for electrical porcelain. It closed again shortly afterwards. 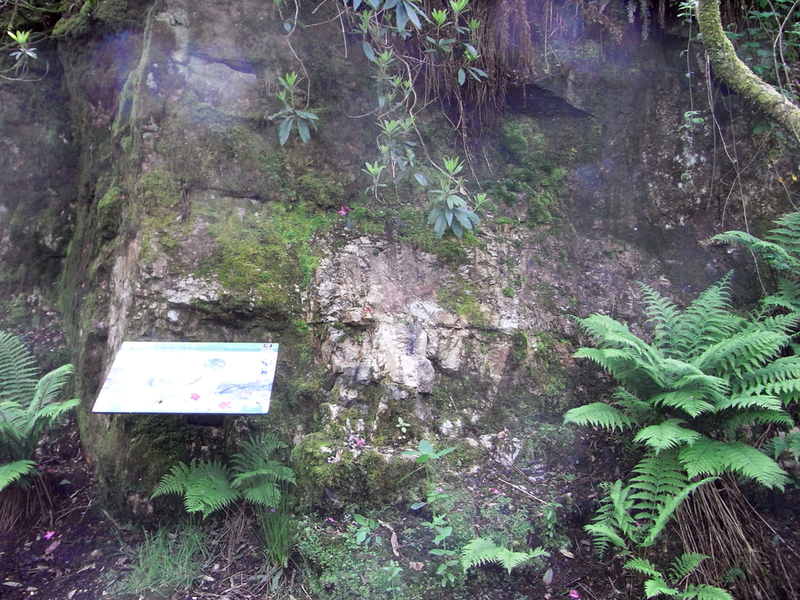 Cornwall Wildlife Trust manage the quarry. Until very recently, the dense vegetation combined with very damp conditions made it impossible to access the quarry. The quarry is managed on the remaining part of a 25 year lease from Goonvean China Clay Company. After studying the exposure, when you return to your car, you will spot low grade ore samples in the unmade road. Only the purest feldspar was used and the rest treated as waste. - A.K. Hamilton Jenkin: Annotations to Ordnance Survey map, scale 1:10,000, sheet 41NE.